This story is not about the Hero, it is about Monsters. They were trapped by scientists and locked inside the laboratory. Night by night they were studied and exposed to evil experiments. But one day they have escaped and now are looking for the way to return home. YOU will be the one who will help them to find the way home while going through mysterious worlds! Are you ready to test your platformer skills against the near impossible challenge? Do you want to have fun all while improving your dexterity? Flex your clicky finger as you jump, double jump, changing gravity and blinking through the platforms. Push your skills to the limit to improve them to the next level! Guide your monsters over the obstacles and on platforms to get to the portal and complete the level. Collect gems and gather coins rewards to unlock more and more monsters. Remember to be careful, one wrong action will lead to the instant death and a respawn at the beginning of the level. ★ Intuitive one touch controls. A perfect platformer on the go! ★ A colourful and stunning pixel art to satisfy your Retro nostalgia! Don’t hesitate to test yourself and improve your platformer skills. 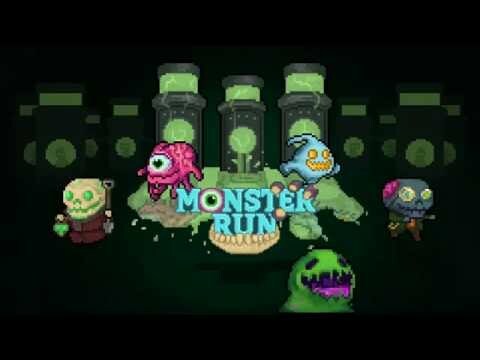 Monster Run is waiting, are you up for the challenge ahead? Download the game now to find out!